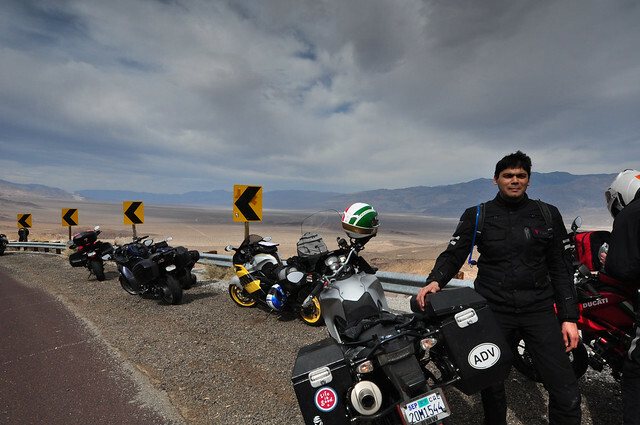 In my previous visit to Death Valley, as a part of a big motorcycle group of almost 15 riders organized by pashnittours.com, we stuck to the smooth paved roads. It was a great trip as it introduced me to motorcycle touring and the joys to be had from two wheels on an open road with endlessly changing scenery. 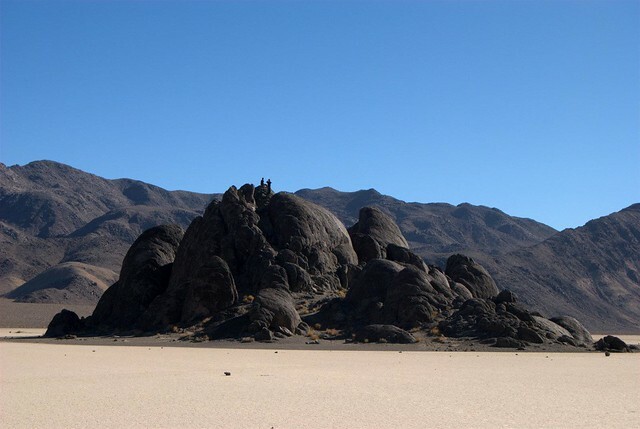 However, there was a part of me that looked far into the distance towards the dry deserted mountains and valleys and wanted to experience it closely. I desired the excitement of raw exploration, unshackled of the modern roads which guide you from one fixed vista point to another I had to learn how to ride off road! I spent the next few months trying to pick up some off road riding skills. I signed up for Doc Wong’s Dual Sport Adventure Riding Clinic. It’s a fun and free way to get some good quality introduction to off road riding by a very experienced rider in a somewhat controlled environment. Like anything else this required lot of focused practice and dedication which I didn’t really do. I fell down quite a bit and made the rookie mistake of focusing on beefing up the vehicle with bash plates and engine guards to protect it from falls rather than practicing the drills to get better and thus falling less . Eventually I made the bike heavier and my little bit of skills even less effective. 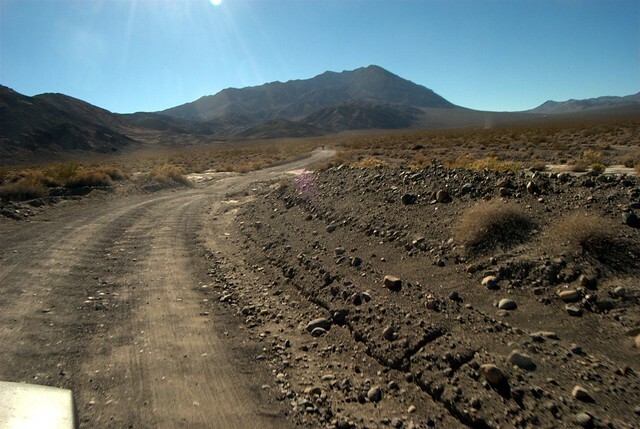 During the Thanksgiving break of 2012 I boldly decided that I now had enough skills to tackle some of the off road trails in Death Valley. 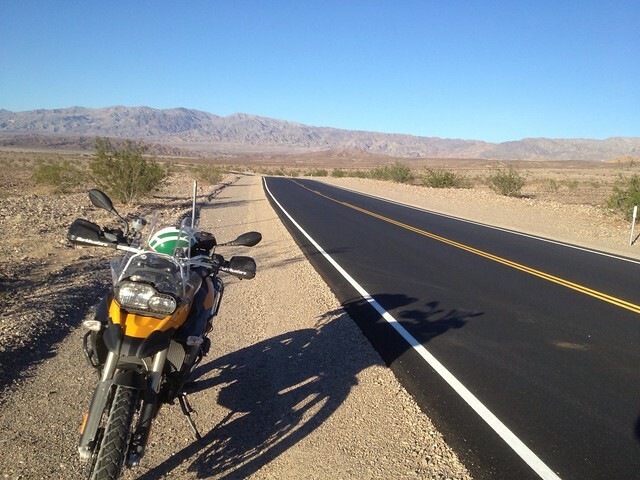 I rode alone all the way to Death Valley on my BMW F800GS. A few friends drove separately by car and rented a Jeep at the National Park. 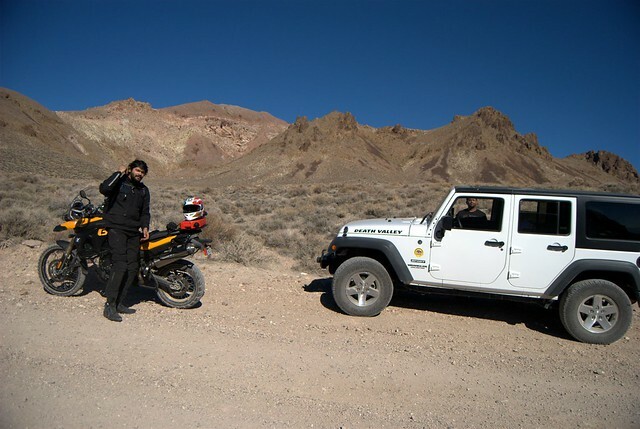 We rented the Jeep from Farabee’s Jeep Rentals at Furnace Creek. The plan was to camp as much as we could and ride our vehicles off road to see the less accessible beauty Death Valley has to offer. These were our beasts for the weekend! We camped at the slightly crowded Furnace Creek Campground. The convenience store near the campground came to my rescue when I realized that I had forgotten my sleeping pad. We ate at the hotel near the campground as well, slowly easing into the ‘roughing it out’ idea for the weekend. The view from the campground the next morning was breathtaking. 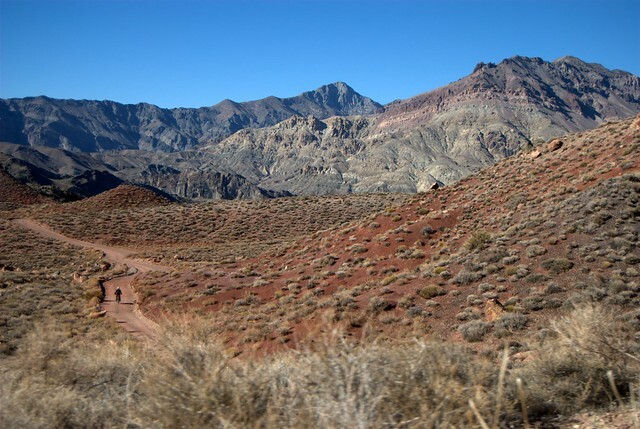 Our plan for the day was to check out the ghost town of Rhyolite and then Titus Canyon. 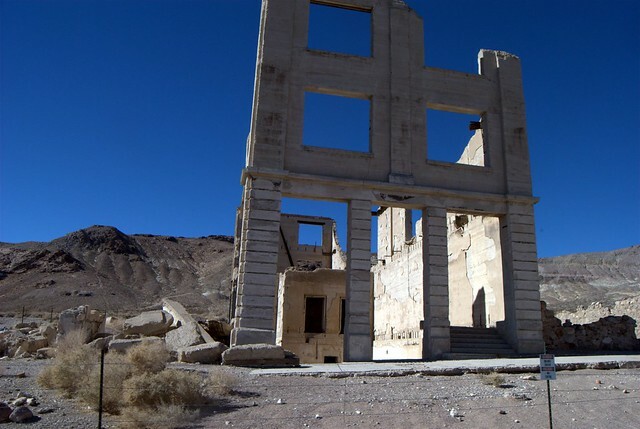 Rhyolite is a ghost town just outside Death Valley on the eastern side in Nevada. It sprung in 1905 as one of the many mining towns filled with gold seekers and miners. After the rich ore was mined off, the 1906 San Francisco earthquake and the 1907 Financial Panic the town went bust and by 1920 it was reduced to ruins which became a mere tourist attraction and setting for movies. 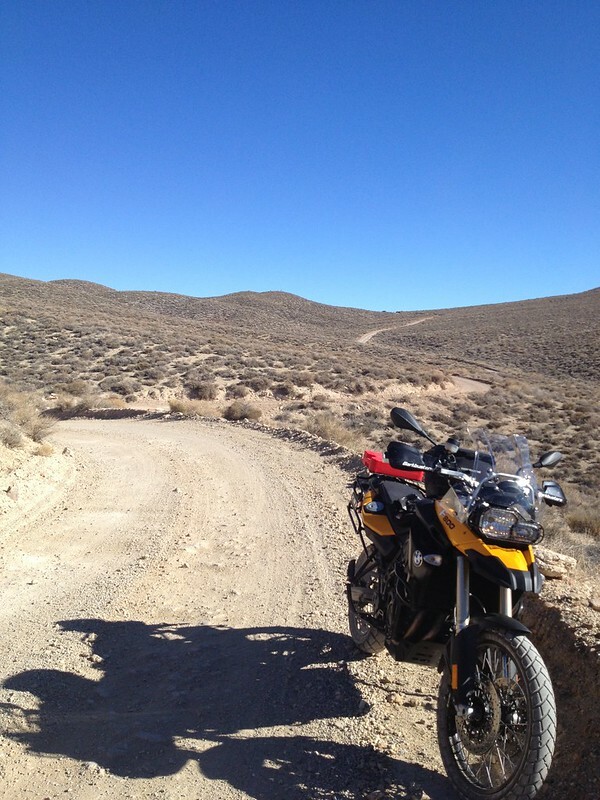 We then rode back into California and went off road towards Titus Canyon in Death Valley National Park. Titus Canyon is a beautiful, deep narrow gorge cut into the steep face of the Grapevine Mountains to the east of the national park. 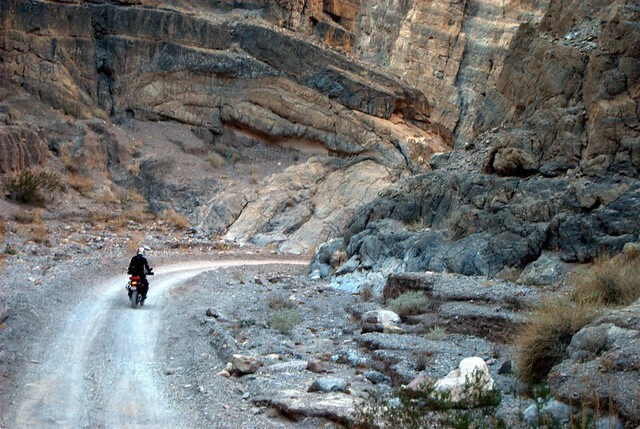 The route to the actual canyon is several miles long only accessible by off road capable vehicles. The trail is wide, straight and washboard’y initially for a few miles and then turns narrower, windier and softer. 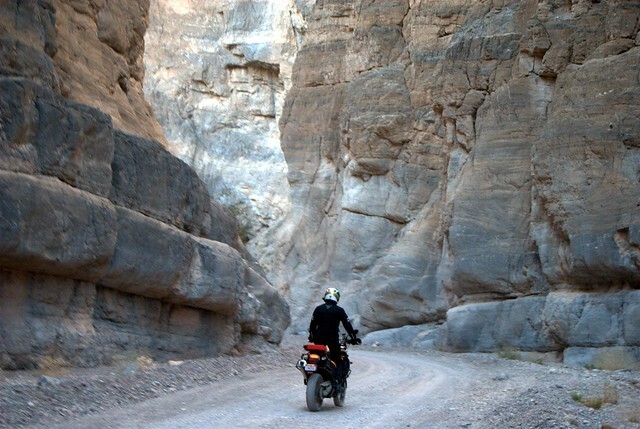 The nearly two hour long ride to the mouth of Titus Canyon is laced with surreal desert beauty. Nature does know how to paint a pretty picture with just a few colors. Leadfield, another ghost town lies on this trail. It was another mining town which sprung in the 1920s and died quickly with its population peaking at 300. This one had a post office! 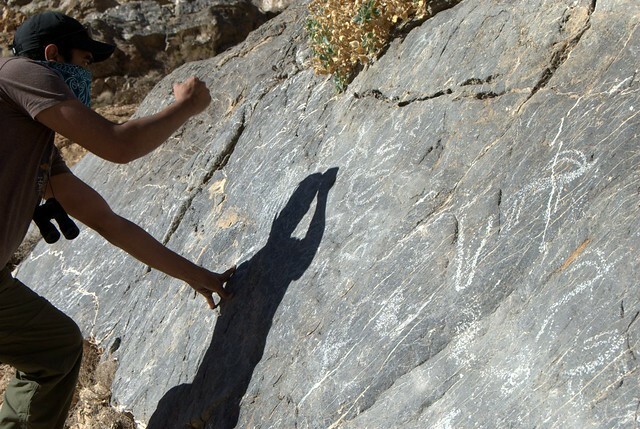 We even saw some of the petroglyphs (rock engravings) carved by the Timbisha Native Americans on a rock face. Having friends along in a car adds tremendously to the comfort level of the trip. I used their Jeep as a support vehicle carrying all my supplies. Oh, and they were good company too. We soon entered the mouth of Titus Canyon. The trail got narrower and the mountain walls closer and steeper. The near vertical stratified mountain walls blocked out any direct sunlight. The canyon is instantly cooler and very refreshing. The complete trail to and through the canyon is a one way and boy was that a wise decision somebody made. The narrow trail and blind curves make it very dangerous for two way traffic and at some points impossible. Titus Canyon is quite a tourist attraction and rightly so. The massive stratified canyon walls closing in on you and the sliver of blue sky high above you make for a near surreal and claustrophobic setting in an otherwise vast open desert. 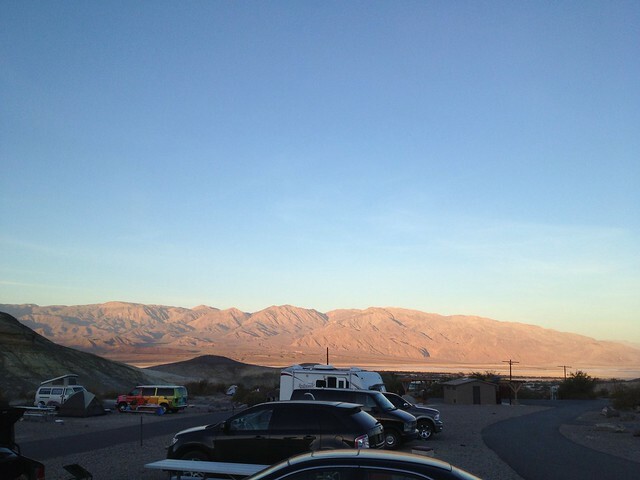 We spent the night at Mesquite Campground which is in the middle of the valley. The openness of the campground meant great panoramic views of the valley and the mountains under the near full moon and really strong winds at night which nearly toppled over our 6 person tent. Our plan for day 2 was to visit the Ubehebe Crater and the Racetrack. Day two started off with a jolt. I woke up with the tent side wall two inches from my face. The strong winds giving us a mere whiff of how furious nature can be. It was quite a struggle to prepare breakfast and pack up with the winds pushing us around. On the other hand my hair never dried quicker. With all the dust and sand, the wash basin in the restroom was perfect for a much needed hair wash. 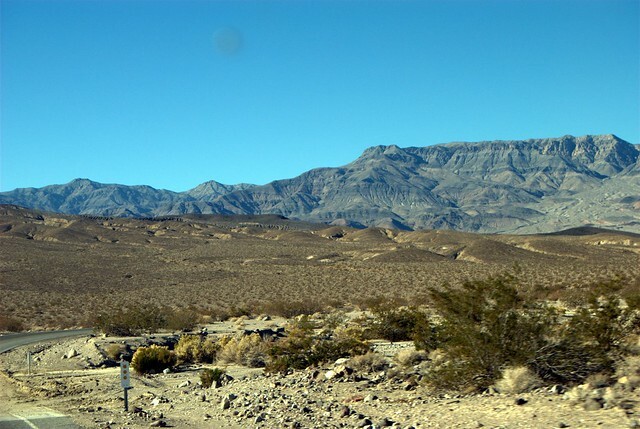 The drive to Ubehebe Crater (pronounced You-bee-Hee-bee) was short and fully paved with majestic views of the Amargosa and Panamint mountain ranges miles in the distance. You never realize how big these mountains are until you start driving towards them and don’t get any closer while they keep growing larger and larger. 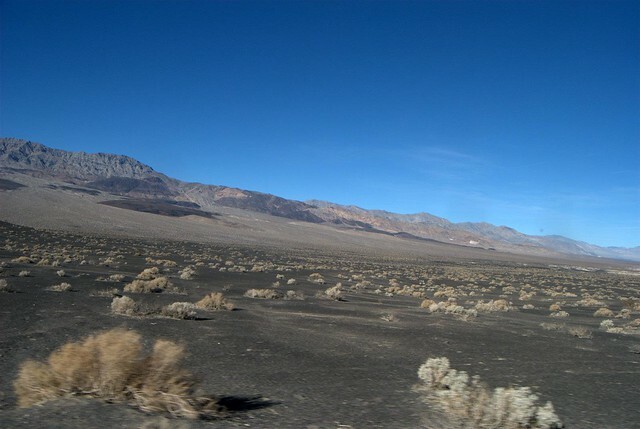 As we neared Ubehebe crater the soil turned darker. It was the dark volcanic ash from the crater which gave the earth a charred look. 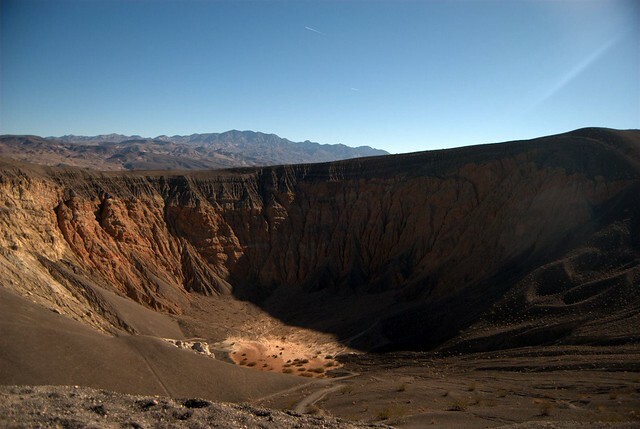 Ubehebe Crater, the 2000 year old volcanic crater that it is, is almost half a mile wide and more than 500 feet deep. The photo below shows the various colorful strata along the crater walls below a thick layer of grey ash which probably is the stuff that would excite geologists. To me its vast size and emptiness just brought about a sense of calmness. I wonder if there was anyone around to witness this loud eruption in the middle of desolate Death Valley those thousands of years ago. There are several trails that run around and into the crater. 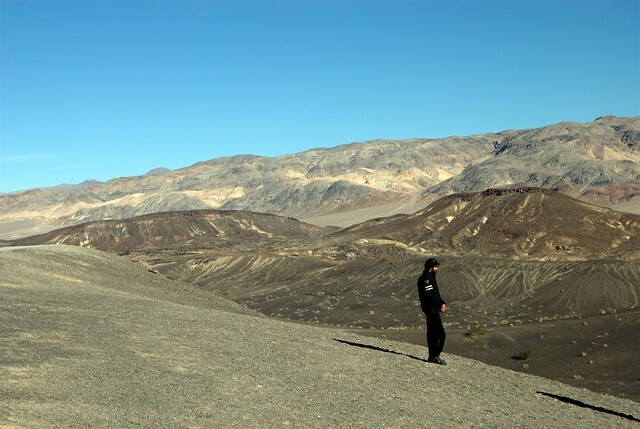 Much like the Badwater Basin and Salt Flats, Ubehebe Crater is a must see when visiting Death Valley National Park as they are very easy to get to. 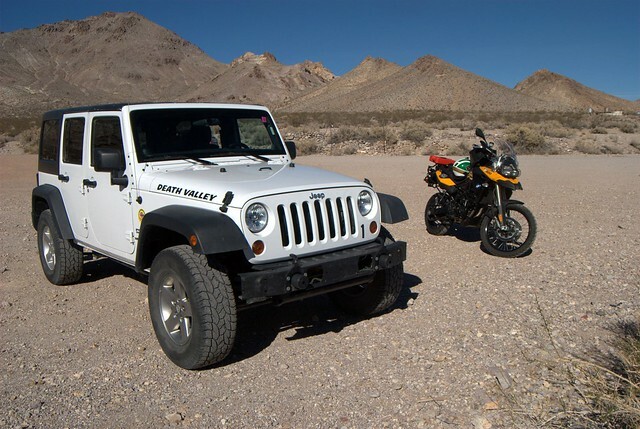 But if you are little bit more adventurous then you must certainly visit the Racetrack Playa which is about 28 miles off road from Ubehebe Crater. The route is windy, gravelly, washboard’y, rocky and sandy but pretty flat all the way to the Racetrack. 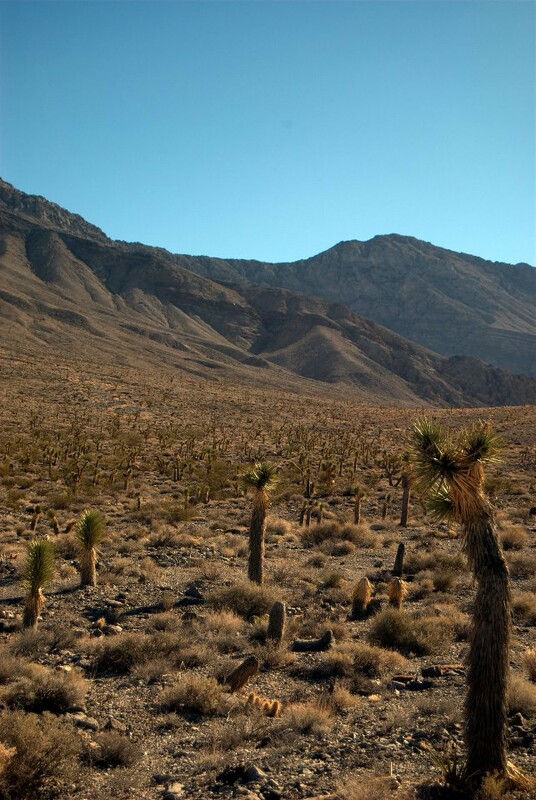 Once you get past the charred earth covered with the grey volcanic ash you enter a Joshua Tree territory stretching all they way to the foot of the mountains. 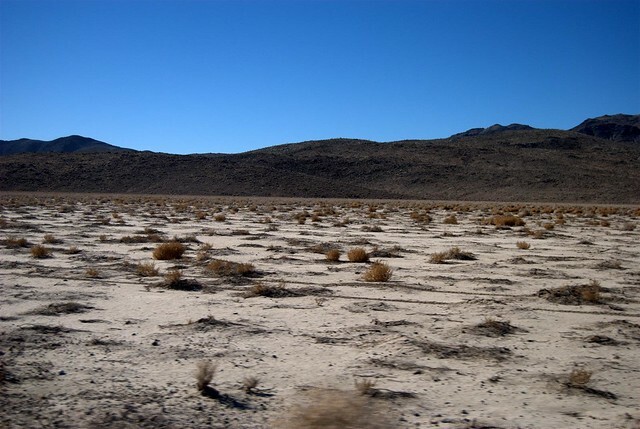 True to the nature of Death Valley and contrary to conventional image of a desert the terrain and scenery keeps changing every few miles. The views were nothing short of majestic but riding a motorcycle off road especially on unknown trails requires utmost concentration and as we neared the playa I caught a glimpse of the white flat expanse ahead of me and dared to stare at it longer than I should have and was instantly eating a mix of sand and shrub. These are the times when you are the most that glad you have friends along who have no choice but to help you. A few heaves and hos later we were back on the track with my motorcycle having earned a few more battle scars. 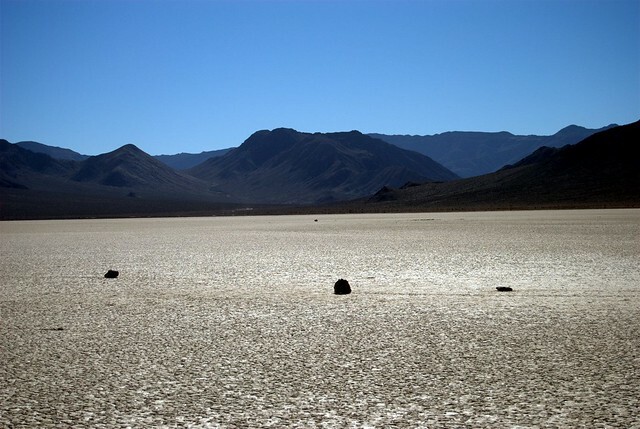 The Racetrack Playa is a large, beautiful, flat, desiccated lake bed which is called the racetrack because of the mysterious Sailing Stones which leave a racetrack like trail behind them. Nobody has seen these stones move. They move once every two to three years and the movement has no particular pattern. In fact the lake bed is so flat and level that the northern end is only 1.5 inches higher than the southern end! 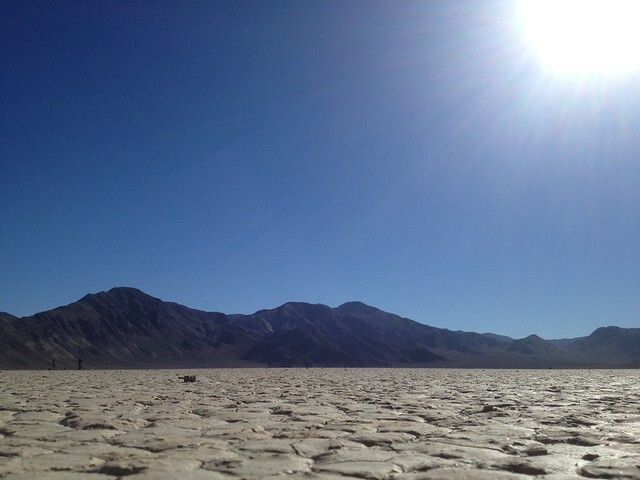 Here is a panorama of the Racetrack Playa. 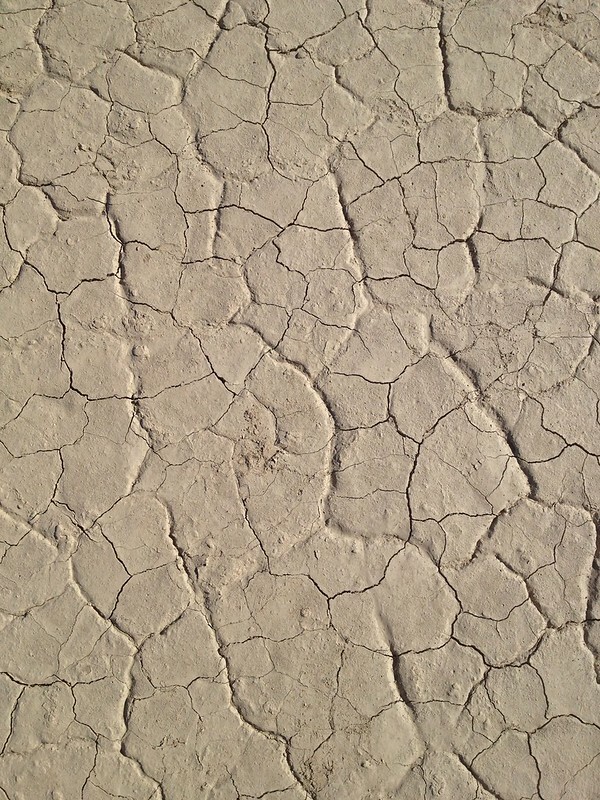 The Racetrack is dry for most part of the year and its surface is covered with polygonal mud cracks which form a pretty pattern. 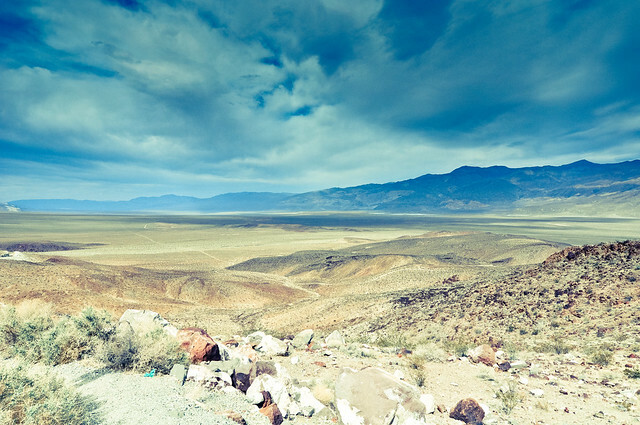 The Racetrack Playa is off limits for vehicles and can be explored by foot only. A small fence provides meagre deterrent to the vandals who sometimes ride their vehicles on the Racetrack leaving behind tire marks which spoils the natural polygonal art. Contrasting the small sailing stones on the white polygonal canvas spread is a dark gray monolith outcrop of dolomite at the northwest corner of the Racetrack Playa called the Grandstand. This extreme contrast makes the the Grandstand particularly impressive and visible from great distances. I think I remember a friend telling me that a pilot of a commercial plane he was once flying on excitedly pointed out the Grandstand from up above. I can only imagine how impressive the contrast would be from up there. We spent some time walking around the Racetrack and soon decided to head back. The ride back to Ubehebe Crater was fun and this time I barely made it without any other mishaps. On the way back we passed a family struggling over the terrain in a Ford Mustang with Texas plates. The low ground clearance made it very slow and very difficult to drive without stones and rocks constantly hitting the underside. While we stopped at Ubehebe Crater getting some rest from the ride I saw the Mustang make it out in one piece. Once we were back on the road we once again passed the Mustang. This time it was pulled over to the side of the road completely out of gas. The stressful ride off road had used up all their petrol. They were nearly 20 miles from any gas station. Luckily for them I had one gallon to spare in my Rotopax can and since the computer on my motorcycle said I had enough left in the tank to make it to the gas station I willingly gave them much needed petrol. They thanked me profusely, asked God to bless me and stuffed a twenty dollar bill in my hands before making a bee line to the nearest gas station. Their blessings worked for within ten miles I ran out of gas too as it turns out that riding off road throws my fuel gauge off. Luckily, again, my friends came to the rescue and fetched me a gallon of gas in my now empty Rotopax can while I waited in lovely peace and quiet by the side of the road. 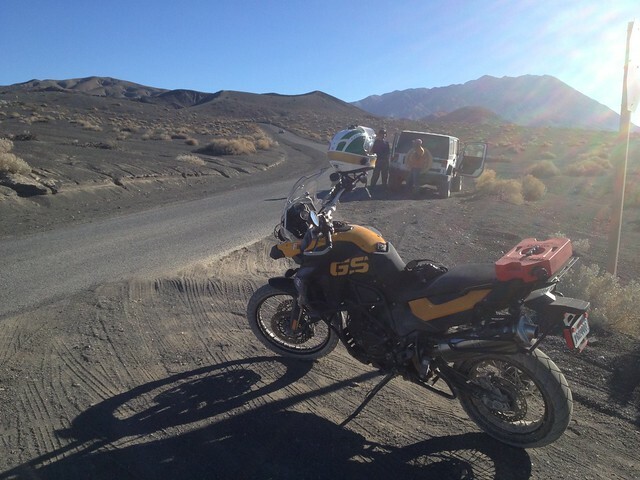 Two days of off road riding had taken its toll on all of us and we decided to spend the pretty penny and get a room for the night at Stovepipe Wells for tomorrow was a long 500 mile ride back to San Jose with plenty of alone time in the helmet to reflect on the beauty that is Death Valley! Riding a motorcycle around is tiring and does not allow time and energy to stop and take good photos. Most of these photos are taken by and borrowed from my friend Jayant Rao. You can see more of his photos here.